I usually try and pair a new release with a similar recent release, or maybe an orphan title that’s been long out of print or never managed to make it to home video in any format, and I had a possible companion to The Incident (1967) which dealt with punks infiltrating the safety of a high rise home. 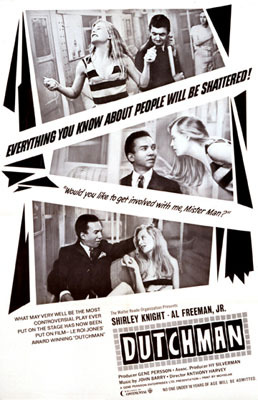 Then I remembered a short film called Dutchman (1966), which marked Anthony Harvey’s film debut as director, and still packs a wallop with Al Freeman Jr. and Shirley Knight as the leads in Amiri Baraka’s adaptation of his stage play. Dutchman has a deeply unstable woman easing up to a young black man on a late night NYC subway ride and pushing him to his limits, while The Incident, Larry Peerce’s film expansion of Nicholas Baehr’s 1963 teleplay “Ride with Terror,” follows separate groups of soon-to-be-victims as they ride the 2am subway home, only be see a boring trip transformed into a psychological experiment by two punks, played by Tony Musante (Bird with the Crystal Plumage) and Martin Sheen in his film debut. They’re riveting dramas and commentaries, and admittedly also performance pieces for each film’s outstanding cast, but what strikes me is their timeliness: whether you ride the train, take the bus, or fly the sky on any carrier, you know the challenges when there’s a disturbance which might ripple your way. Driving is very different – you’re still sealed inside a protective cell – but on a public vehicle, you can’t choose your neighbours. You mind your own business and just want to get from Point A to B without incident, but once in a while something happens. When the TTC upgraded its trains on Line 1 with interconnected cars, it made it possible for anyone to walk the entire train length and carry a disturbance or unruly activities to everyone, whereas the classic trains were separated units, and if the need to flee mandated a quick jaunt, you had to wait for the next stop and hop cars. So what if there’s only one way in and out, as is the case with The Incident? And what if a deeply disturbed person with an agenda insists on interacting with you, as happens in Dutchman? Someone determined to amuse themselves at your expense because they know even if you can leave, there’s a boundary of politesse and fear which a button-pusher knows you’ll hide behind, even when something awful is happening in close proximity to you. Whether racially motivated, mean, or deranged, the two films deal with a theme that director Peerce says has often attracted him to unlikely projects: the masks we wear, and what we do behind them. Both films conclude with explosive exchanges on racism, but Incident is broader in following what Twilight Time’s ace co-commentator & moderator Nick Redman describes as two very smart young men who behave like kids, but are determined to dress down every person of every colour, creed and persuasion because it’s fun, and because they know they not only have the power, but know how to retain it. They’ve also got an exit plan – most likely bolt at Grand Central Station – and they know nothing will happen, because to speak up might be embarrassing for the riders; most likely everyone wants to get to Point B fast, and forget about the whole ugly night. 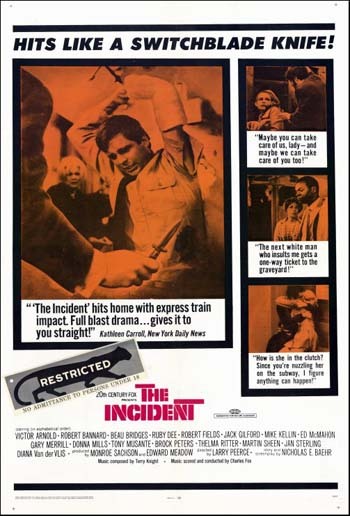 Incident is one of those small films that got lost – it reportedly received full screen VHS and laserdisc releases around 1990, and little else – but as happens, orphans do find a welcome home on disc now and then, and Redman’s discussion with Peerce is one of the label’s best chats on a filmmaker’s career. Both Knight and Baraka participated in a documentary called Dutchman Revisited, which has yet o be released. Maybe directors Naama Kates and Lukas Persson are hoping for a synergistic special edition that would pair their doc with the original short that’s been OOP on DVD for some time. Incident is also unique for featuring a wealth of feature film debuts by several up-and-coming stars, plus appearances by great character actors – this was Thelma Ritter’s second-last film – but there’s also an unexpected connection between the two aforementioned films. Both Musante and Freeman appeared in the semi-sleazy Frank Sinatra drama The Detective (1968) with the former playing a punk psychologically and physically stripped down during an interrogation, and the latter as a discrete detective.